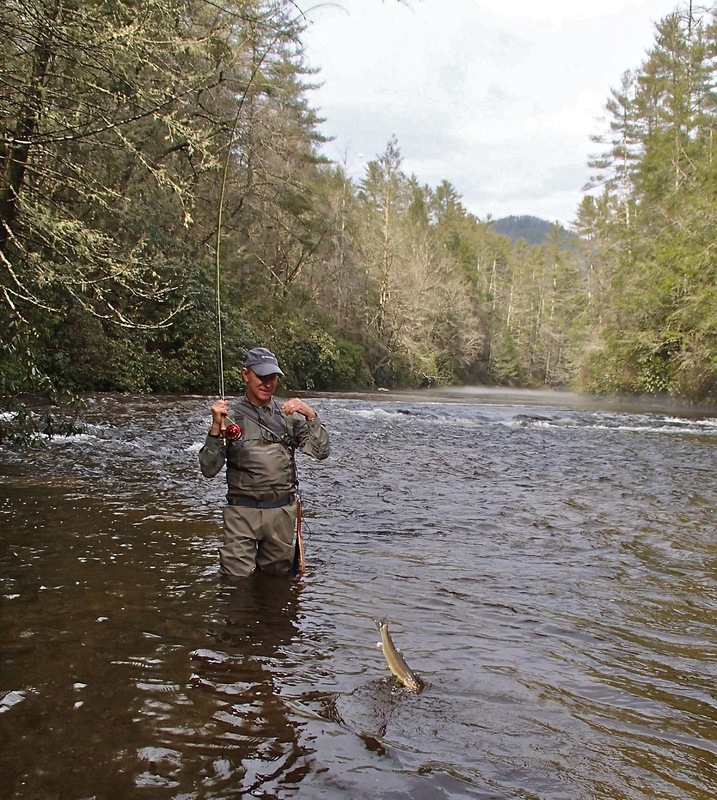 The Liars Club: Did You Make It To The Chattooga This Weekend? Did You Make It To The Chattooga This Weekend? 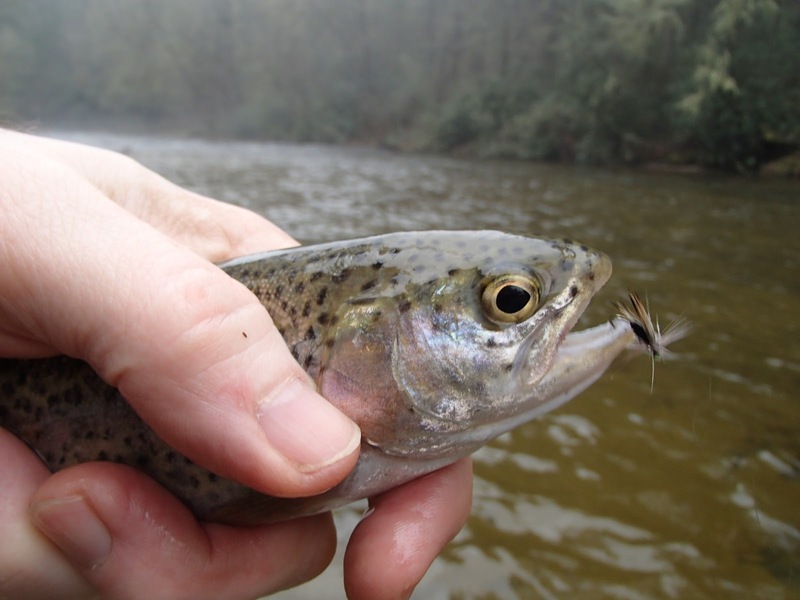 If you did, you experienced spring-like weather, black stoneflies, 52 degree water and, overall, just a great day to be on one of the most beautiful rivers in the country. We didn't rush to get there early, left Cornelia around 10:30 Saturday morning for a leisurely ride north. We were fishing a little after 12 noon. The South Carolina parking lot at the DH was almost full; we got the last spot and assumed the river would be full of anglers. Turns out there were several anglers up and down the river but it certainly was not crowded at all. Hey, anyone can hook a fish in the mouth! About 1:00 the little black stones began flying around, touching the surface now and then but rises were few and far between. The rains from Friday had pushed the Hwy. 76 gauge up just barely over 2 feet but by the time we stepped in the river it was probably around 1.95' and dropping. The water was stained but not muddy at all. It almost had a tannin stained appearance to it. We briefly discussed whether or not the stain was preventing the fish from keying in on the stones but then decided it really didn't matter. We were happy dredging and steadily catching fish. I did manage several fish on a small black soft hackle but they wouldn't touch a black stonefly nymph. A glass bead pheasant tail nymph with copper wire wrapped around the body was productive early on but eventually quit producing. All the small flies I tried were dropped off behind a Pat's Rubber Legs and a few fish took it through the afternoon. Enough that I never took it off and my big fish of the day (this nice brown in the photo) was compliments of Mr. Pat. Just before hooking this nice fish, I had noticed an angler upstream who appeared to be in a wild battle with a good fish. Later as he walked by I asked if he had caught a nice fish. He told me it was about a 20" brown...on a Pat's Rubber Legs. Big fly, big fish! My fishing buddy Jeff was dredging most of the day as was I but he decided to return on Sunday with his 3 wt. and fish nothing but dry/dropper rigs. The little black stones were coming off again after lunch and he had steady success. He also reported that the water was clearing from the rains so maybe the stain did have something to do with it. It's raining almost every day this week and things are expected to turn colder but this is prime time on the Chattooga DH. If you can get away, and the water level is 2 feet or less, you need to plan a trip there. And you may want to pack some Pat's Rubber Legs.